Videogram: Vinyl of the Month! 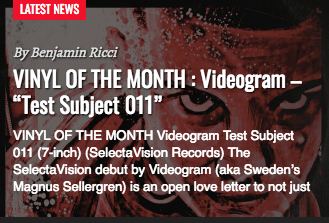 Extremely excited to receive the news that Performer Magazine picked my Test Subject 011 7" on SelectaVision as their Vinyl of the Month! Reviewing the single, they sum it up as "an open love letter to not just Stranger Things, but everything in the 80's VHS Horror world", with the A-side sounding as "a long-lost Italian disco version of a vintage John Carpenter soundtrack," and the B-side as "if Fabio Frizzi had scored The Neverending Story"! For fans of old school slashers and those who miss browsing the aisles of Blockbuster for the latest horror releases on VHS, this contemporary re-imagining of a lovable niche genre is just the ticket to bring you back to those glory days. Again, this is very exciting news. Many thanks to Ben and the rest of the staff for this honor. Read the review in full here. VHS Lives: Pre-orders available now! Voorhees Stomp (Acid Washed Remix)!